Arrhythmias are uncoordinated or uneven beats of the heart muscle. They're caused by a problem in the electrical system of the heart. Some are harmless and won't cause problems. Others will cause more problems and will need to be treated. Two upper chambers (atria)—Get blood from the body and lungs. Then, the blood is pushed into the ventricles. Two lower chambers (ventricles)—Get blood from the upper chambers and pump blood to the lungs or out to the body. The left side is the strongest chamber in the heart. It pumps blood to the whole body. The chambers need to beat in a certain way. This helps the heart to move blood all over the body. A nerve signal keeps the heart beating at 60 to 100 beats a minute. The nerve excites the heart in a certain pattern. The relaxed atria fill with blood. Then, the signal forces them to contract. This pushes blood into the relaxed ventricles. 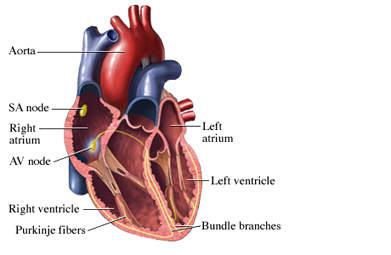 As the signal moves down, the ventricles contract, pushing blood out to the lungs or body. At the same time, the atria relax and fill with blood. The cycle repeats with each heartbeat. The electrical signal starts in the sinoatrial (SA) node in the right atrium. Bradycardia —Heartbeat less than 60 beats a minute. Tachycardia —Heartbeat more than 100 beats a minute. Brief rises in heartbeat are a normal reaction to physical activity. This helps supply more oxygen to working muscles. Tachycardia that isn't in response to physical activity can cause problems or be a sign of problems. What are the types of arrhythmias?What causes arrhythmias?What are the risk factors for arrhythmias?What are the symptoms of arrhythmias?How are arrhythmias diagnosed?What are the treatments for arrhythmias?Are there screening tests for arrhythmias?How can I reduce my risk of developing an arrhythmia?What questions should I ask my doctor?Where can I get more information about arrhythmias? About arrhythmia. American Heart Association website. Available at: https://www.heart.org/en/health-topics/arrhythmia/about-arrhythmia. Accessed January 3, 2019. Arrhythmia. National Heart, Lung, and Blood Institute website. Available at: https://www.nhlbi.nih.gov/health-topics/arrhythmia. Accessed January 3, 2019. Heart diseases & disorders. Heart Rhythm Society website. Available at: https://www.hrsonline.org/Patient-Resources/Heart-Diseases-Disorders. Accessed January 3, 2019.